Here in the Philippines, we still have November 1st and 2nd (or more famously known as Undas) to get busy with before we can officially declare Christmas. But typically Pinoy, it's the yuletide season for us once we hit the -Ber months. Well, for me, I start to actually feel, see and believe it when my husband's year-end bonus arrives, haha. 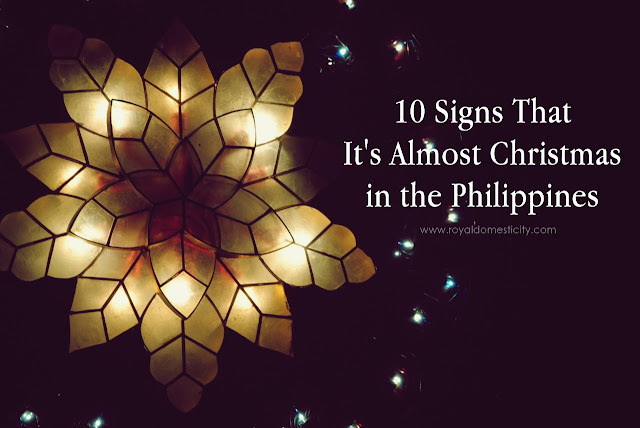 Anyway, before someone else rolls her eyes with that statement, allow me to share you my list of satirical, funny, a bit scary but super spot on signs that it's almost Christmas in the Philippines! 1. Cab drivers become more choosy than ever. "Dagdag na lang kayo ng bente, Ma'am", "tsk, tsk, ang layo yata nun", "trapik dun eh, metro ba?" and the endless taxi driver dramarama lines continue. Grabe 'di ba? Ay ako muther, I really make a scene 'pag salbahe ang manong driver. Even if I'm at the middle of EDSA 'pag pinaandaran ako ng ganyang emote, may I go down ako. I pretend, too that I'm talking to an MMDA officer on the phone. Minsan, si jowabelles kunwari. However, when I chance upon real nice ones, I make dagdag bente without him telling me. 2. A platoon of Santa Claus figures displayed in the bangketa, along with parol and other holiday decors. See, even St. Nicholas loves to make tambay in the dusty streets of PI. 3. Ninongs and Ninangs are practicing the art of deadma. This is my favorite. Sophia has 12 pairs of godparents but you know what? Gift-wise, I felt like we only get around 10 on her birthdays and during Christmas. Presence-wise naman (in person or online), 6 or 7. But we understand you, guys. Ganyan din naman kami sa inyo eh. Hehe. 5. The campaign for single-blessedness being with family (and fur babies) are getting stronger. Saying that having no partner means no problems or no expenses or whatsoever excuse. I don't want to elaborate anymore. 6. Wind burn. Chapped Lips. Dry skin. But I love my hair's texture as it gets colder. Hindi siya close to being afro. 7. Hams galore: TVCs, print ads, radio jingle, etc. Get the finest cuts. Look for the net marks. 8. Carolers who don't finish the song. Sad. Ay naku mga bagets, I will not give you my barya if you don't have that make-shift tambol and tambourine. I will not even open my door if you will just make palakpak ha. Everybody happy dapat ang peg! 9. Pick-pocketers / hold-uppers / snatchers / bad guys / evils / mumu / mga kaborkot na manong and manang are like mushrooms na nagsusulputan everywhere! Teh, sige na mayaman ka na ha. Pero don't wear naman the whole Karat World when you go to Araneta Center to witness the lightening ceremony of the giant Christmas Tree. Ingat lagi tayo! Maging mapagmatyag at mapanuri. 10. Lastly, nagkakaubusan ng fruit cocktail, NESEL cream at spaghetti sows. Tapos lahat ng puntahan mong bahay pagdating ng pasko, may buko salad, macaroni salad, potato salad, at kung anik-anik na salad. Hanggang 2nd week ng January, may salad sa pridyider. There you have it - My 10 SIGNS THAT IT'S ALMOST CHRISTMAS IN THE PHILIPPINES! If you have more in mind that you wish to share, type it down in the comments section. This will be one fun discussion on how we Pinoys celebrate Christmas. 85 days to go! This post is brought to you by Zalora Philippines but all thoughts and opinions are my own. Photo courtesy of Pares, atbp. I like the last one - NESEL Cream. OMG! Naaalala ko ang mala-jejemon na pag-pronounce ni MIL ng NESEL Cream. Bad girl! LOL! E kasi nga diba, casTLE = nesTLE? Ergo, it is pronounced as NESEL! Lol. Di ko pa ma feel Ms Bebeng, kasi wala pang 13th month pay! Ouch :) Hehe! Napakatotoo ng list na yan! Haha! Ay naku, hindi kami masyadong looking forward pag Christmas at New Year kasi dyan required mag duty si Daddy A! :( Ang pinakacelebration na lang namin ay birthday ni Baby C tuwing December 15th.